Twins who transitioned together are telling their story to help others. 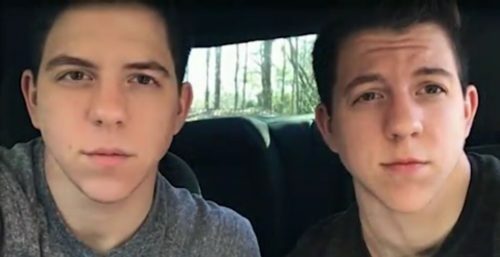 Jace and Jack Grafe, 23, are inseparable twins from Georgia who do everything together. They have the same friends, the same interests, and they are both working as corrections officers. They even started hormone therapy at the same time. But it wasn’t until Jace and Jack were 14 that they had even heard the word “transgender.” Both were assigned female at birth but knew that they were boys. Related: These twins came out to their mom. Her reaction is so perfect they put it on YouTube. Still, they were from small-town Georgia and they attended a Christian school. It took time for them to even share their feelings with one another. They kept on presenting as female until they finished high school, but when they were done they started exploring their options to live authentically. When they were 21, they started hormone therapy within one week of each other. Jace said that if it weren’t for his brother, he would have had a harder time accepting himself. “I feel like we’ve saved each other from a lot of really dark and depressing moments,” he said. Today, they’re each in a relationship and their driver’s licenses have male gender markers. “It’s real now, it’s official,” Jack said.